Two new look-alike homebuilts have members of the prestigious Experimental Aircraft Association considerably confused today about which is which and what is what. I refer, of course, to Quickie Aircraft Corp’s. exciting new two-place canard design, the Q2, and Viking Aircraft’s beautiful Dragonfly, also a two-place canard design. The situation is reminiscent of Charles Lutwidge Dodgson’s 1872 classic, “Through the Looking-Class,” a fantasy based on a chess game in which left is right, up is down, and more is less. I have flown formation photo missions with both these aircraft and must confess both are breathtaking in appearance, a tribute rightfully belonging to Burt Rutan who initially evolved the planform on which each is based. However, despite the obvious similarities, they are two distinctly different flying machines. HOMEBUILT AIRCRAFT brings you the views of each designer, to help you judge for yourselves what the homebuilt movement is coming to! 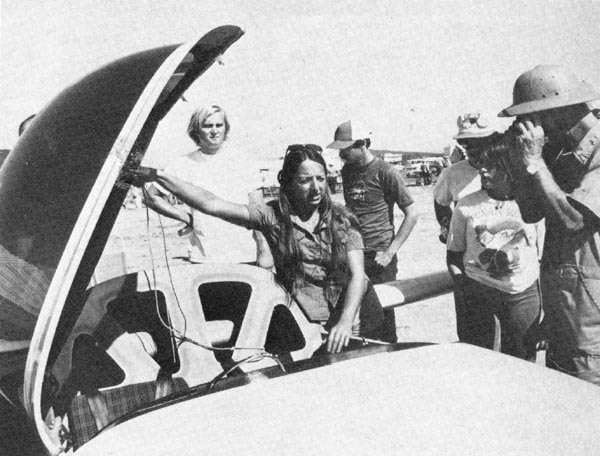 is standing next to the windshield and Bob Walters is standing far right. Dragonfly, as you all know, produced a sensation at the EAA’s Oshkosh ‘80 convention and flew off with the Outstanding New Design Award, an evaluation made by John Winter and his Custom Aircraft team of judges. Later, at the Ramona, California, EAA Fly-In last October I talked with the Dragonfly’s designers, Bob Walters and Al Nelson. Walters, an exNavy jock who once taught thr Iranian Air Force how to fly Tomcats, kindly agreed to a photo session and flew the type of formation that can only be called professional. Later, Bob conducted a seminar at Ramona. demonstrates the cockpit to visitors at Ramona Fly-In. Walters, a Lt. Commander, USN (Res), has built both a Duster sailplane and a VariEze composite aircraft in his garage. Besides his Navy service and flying for TWA until furloughed, Walters found time to complete his education as an aerospace engineer at San Diego State University. Nelson, a practicing attorney, graduated from shaping composite surfboards to building a wooden Duster also. With that design goal in mind, Bob and Al looked the market over and decided there was nothing that filled the bill. 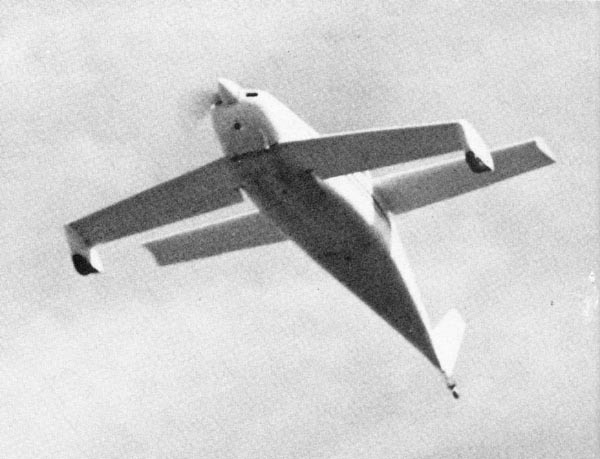 “The equal area canard planform did offer some real advantages for an airplane of this type,” Walters told me. “For one thing, you don’t have an expensive landing gear because you make the major portion of the landing gear when you make the canard. It doesn’t take any fancy welding to make a landing gear of this type. “We also attempted to eliminate expensive wing fittings and still maintain a reasonable aspect ratio. If you take a look at the wing area required to fly two people on a small engine, it turns out to be considerable. If you split that wing area into two airfoils with basically equal area, you can maintain a reasonable aspect ratio and keep the span down to something a homebuilder can construct as a single piece in his garage. And you can make some simple attach fittings at home with a hacksaw, instead of an exotic wing fitting which would drive the cost up. both seats, though single throttle is positioned at left. “Our wing and canard are both built as a single piece in a jig in a normal two-car garage, and we thought we were going in the right direction, trying to keep the cost down. Then we took a look at what was available in the powerplant department, and the small 1600cc VW looked viable for a suitably designed airplane. “But in order to have reasonable performance the plane would have to be fairly clean aerodynamically. It would have to fly with a minimum of drag because the thing that makes an airplane climb is excess horsepower — you want to use as little as possible to fly the airplane, and what’s left over you can use to make it climb. No major problems developed during the flight test period, which included inflight loading to utility category limits, basic performance testing, propeller testing, CG envelope expansion, etc. With that out of the way, Walters flew Dragonfly east to Oshkosh, cruising at 140 mph and burning gas at the rate of 45 mpg with the 1600cc VW. Dragonfly, says Walters, demonstrated satisfactory takeoff performance at a DA of more than 9000 feet. What’s new and different about Dragonfly? “Some features are new, at least insofar as homebuilders are concerned,” Walters continued. “One thing we discovered when we looked at our wide canard landing gear was that we’d need considerable stiffness in the canard. We had done some early experiments with carbon fiber and were fairly pleased with the results. In years past, carbon fiber has been expensive, but now it is becoming a popular engineering material, and its cost is what we consider fairly reasonable. 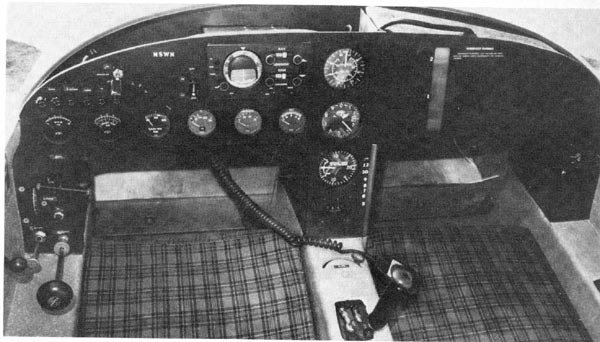 Among design considerations that led to Dragonfly’s planform was to go to side-by-side seating to accommodate CG restraints, and this led to a cockpit width of 43 inches, like a Cessna 172. A molded canopy was selected to avoid the soap-bubble effect of a free-blown canopy, and the fuel door was fitted with a magnetic latch to eliminate hinge drag. 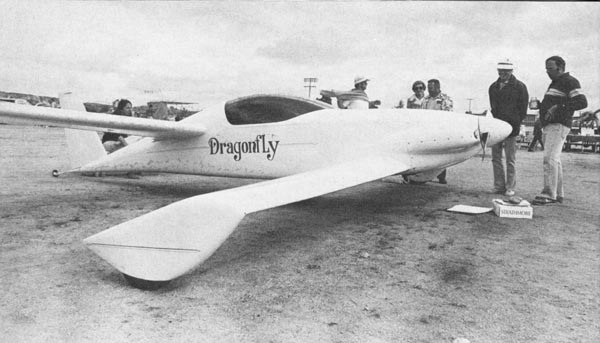 Commenting on Dragonfly’s construction, Walters said: “We had some experience building the composite aircraft in the past, and we felt there was some information and/or basic construction techniques that left a little to be desired. The idea of whittling or carving something to an efficient and eye-pleasing shape is sometimes easier said than done. “Most people are familiar with the hot-wire technique of core construction, and we use the same basic idea. We use a 4 ½ pound density water- blown polyester-base urethane foam, and in our opinion it’s pretty nice core material. It has a little springback to it and enough density so that when the panel is tested to destruction the core doesn’t collapse. You can actually get a failure of the skin itself instead of collapsing the core. “Also, it’s relatively inexpensive, not sensitive to ultraviolet degradation. And it’s available. So most of our fuselage is made of this ½-inch foam, and the question naturally arises — using ½ inch foam, how do you get those big-radius corners? “Cut several female-type bulkheads out of particle board (chipboard) following the patterns in the plans. Nail them to your bench on 18-inch centers and bend in ¾ -inch square wood stringers spanning the bulkheads. You now have a crude female mold that takes about four hours to build and costs about $7. 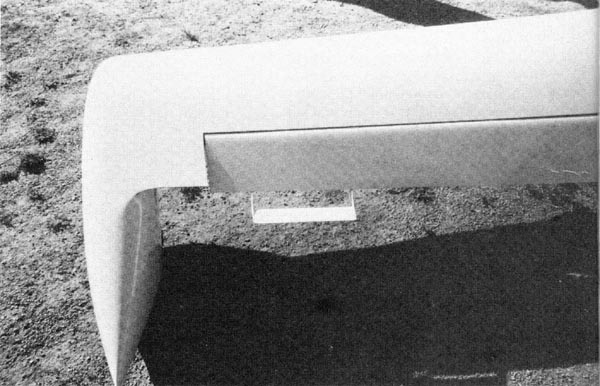 The foam used for the fuselage top is ½ inch thick, and one side has a grid of saw cuts ¼-inch deep. This machining is done by the foam manufacturer to allow it to accept a compound curve. This sheet of foam is pushed into the mold and glassed on the inside. After cure, the part is removed and fastened to the three-sided box fuselage. A little sanding to match the edges is all that is required, and the builder now has a nifty compound curved fuselage ready to glass on the outside. designers, who feel the extra width is worth it. still permit a “nice stick feel,” say the designers. 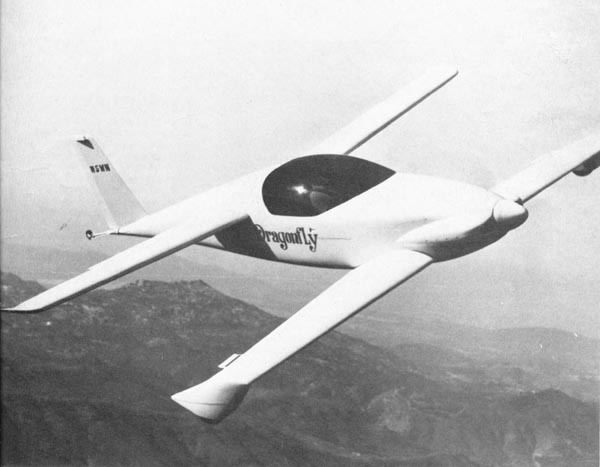 Viking at this writing was planning to flight-test the 1835cc VW, primarily to give better high-DA climb performance. But according to Walters there will never be an authorization to use the 2100cc VW, any certified aircraft engine, or any turbo engine.” Any such changes would require a complete redesign of Dragonfly and would defeat the whole purpose of its design,” he explained. A local VW engine rebuilder assembled Dragonfly’s 1600cc VW, a stock engine with sodium valves, chrome moly pushrods and a counter- weighted crankshaft. The total cost, according to Walters, was about $1,100, including a 29mm Posa carb, 10- ampere alternator, and direct-drive single Slick mag. Plans for Dragonfly should be ready by this time, with the cost $175 per set, and negotiations have been under way with a major parts supplier to provide kits. The cost to build the prototype ran around $5,000, and construction time for the average builder is estimated at around 750 hours.